Tina Burner is a refined table that can be used for your afternoon tea or your morning match. 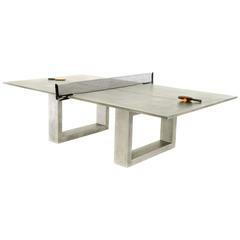 Its playful design transforms into a ping pong table. Open the drawer and grab a racket, let’s play! Its rattan net has two positions and once set up, it turns into a real attraction. Its rollercoaster legs carry the balls up and down and around for your numerous games. And when you are ready for an athlete's rest, you can gaze at its phosphorescent top that reveals a constellation in the dark. A third of the size, it aims to bring fun back to the living area using a reasonable amount of space. Holz ist ein natürliches Material, das jedes Stück einzigartig macht. Die Änderung der Farbe ist seine Natur eigen. Zubehör für Tischtennisplatte. Zubehör-Kit: 4 Stiga Flow Outdoor Paddles und 6 Stiga 3 Sternekugeln. Preis: 175 $. Bezug mit Logo (empfohlen für Außentische). Ein beeindruckender und schöner Kaffee- oder Cocktailtisch im Stil von George Nakashima aus den 1950er Jahren. Aus massivem Ahornholz, in sehr gutem Zustand.